I love project-based learning. Why? Because my students do. Some of my favourite PBL adventures are the Biology 30 projects due at semester’s end. These aren’t the only projects we pursue throughout the semester; we also work on a number of digital creations. However, these tend to be the most intricate and hands-on. For the past week, my students have been sharing their projects. They don’t give their presentation at the front of the room (although that’s an important skill to learn too). Instead, we sit in a circle and share. I’ve found doing it this way creates more interaction among my students than the “stand and deliver” in front of an audience. 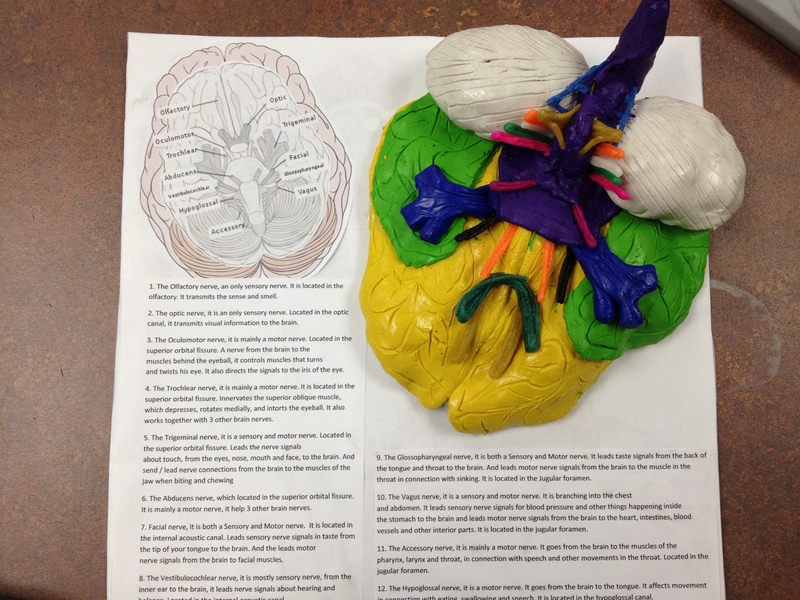 The topic for this particular biology activity was body systems. My students were to create a project on any system in the body. It’s a really broad topic, I know. I do that on purpose. Over the past two months in class, we’ve studied 5 different systems, but students aren’t limited solely to those. Often students are interested in things we don’t have time to explore in class. This project allows them to do so and reinforces the big idea that the best inquiry begins with high interest. 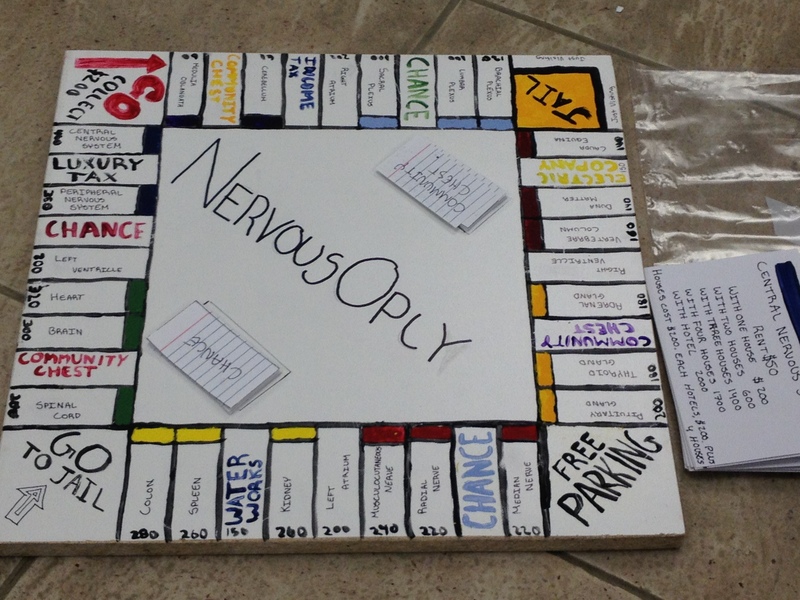 One of my students created a Monopoly-type board game based on the nervous system. Each of the different properties represented a different aspect. The Community Chest & Chance cards also contained many facts about the system, in addition to the usual penalties or rewards. But the best part of his presentation, to me, was when he stated: “I really enjoyed doing this. It was a lot of fun â€” a ton of work, but a lot of fun.” And that’s why I love project-based learning. It allows my students to really focus on, and learn deeply about, things they’re interested in — which often causes them to work hard, enjoy the process of learning, and gain a great deal of satisfaction once they are finished. 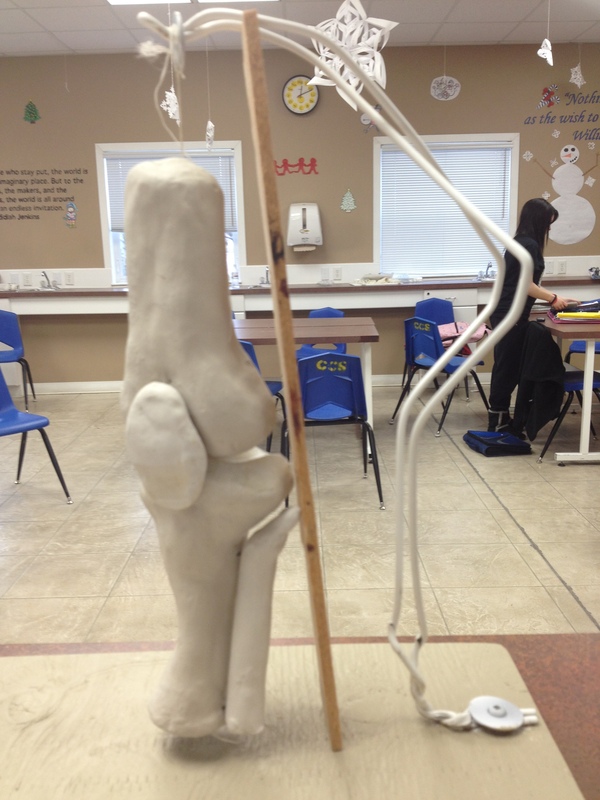 Another student researched and created a model of the knee. She has knee problems, and as an athlete, she experiences the real pain of these problems quite frequently. During her presentation, she showed the parts of the knee affected, informed the class how these problems affect her, and described possible treatments and surgical options. It took her hours to create the knee from Plasticine. This is the second reason I love PBL; it often becomes personal, allowing students to understand more about themselves or others they are close to. 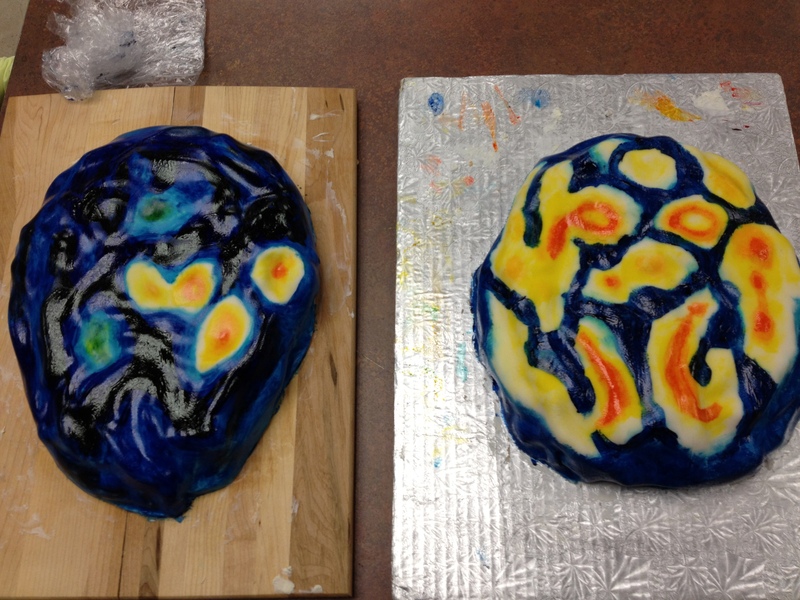 A third student created two cakes (shown below) â€” each depicting a brain state. The cake with large portions of yellow illustrates the activity in a healthy, functioning brain. The brain that is predominantly blue shows the functionality of a brain struggling with depression. Wow. I was shocked to see the difference. And this is yet another reason PBL can be powerful. It allows students and teachers to see what might often be taught as vague, abstract concepts. This particular student chose this topic because her family has been deeply and painfully affected by depression. She wanted to understand it better and her project research and inquiry was meaningful to her far beyond the basic knowledge she acquired. We also learned about hip replacements. The father of one of my students is a doctor. She was curious about how hip replacements work, and through his contacts he was able to procure the authentic implants that are used in a hip replacement. How many people actually get to see what those look like? Which is the final reason I love PBL – I learn a ton from my students, and it allows my students to experience the reality that they have new knowledge to offer to those around them. The PBL classroom allows students to learn from each other, as well as me. 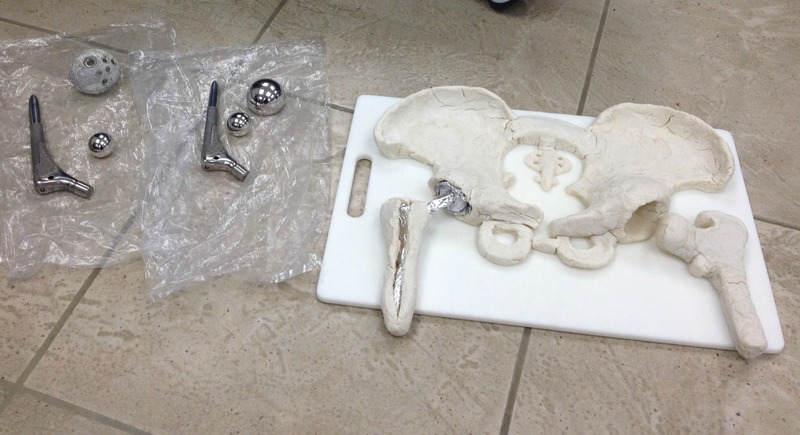 My student created a playdough version of the pelvis & hip bones to show how hip replacements fit. During her presentation, she spared none of the gory details of the surgical process. Trust me, it was readily apparent by the looks on my students’ faces who might be successful at pursuing a medical career and who will likely steer clear of it. The intricate detail of the process was truly amazing. During these presentations I’m often surprised by the amount of complex learning that occurs and the enthusiasm my students have towards it. While some teachers may wonder about the merits of PBL, I’m sold. My students have learned much more in an inquiry classroom than others did when we had a traditional one. PBL allows them to have a say in what they learn and how they present their knowledge. Every semester I’m impressed by the hard work and energy my students pour into their projects. It’s not enough for students to learn a bunch of disconnected facts. They need to be able to synthesis them into a comprehensive whole and create something from what they’ve learned. Often they’ll connect them to their lives in ways we could never have imagined. I love PBL and so do my students. It really makes school worthwhile. Wonderful article! It does take a “final exhibition” or project for students to synthesize their learning. I often had my students make a magazine synthesizing their knowledge from a variety of sources, (information texts, internet, movie), using a list of non-fiction features to make their magazines come alive. Students love to draw and color and create…Students liked to include an informative cartoon, poetry, crossword puzzles, etc. to show what they learned about an aspect of culture, nutrition, etc. You are right; Disconnected facts will not be saved in someone’s long-term memory. Using the facts to create a project is meaningful and interesting. I have a variety of photographs showing student work in the forms of “final exhibitions,” and text describing the process of the learning. Project Based Learning is engaging!!!!!! Hooray for PBL! Thanks, Marcy. The magazine idea you speak of sounds like another great example of kids engaged in PBL learning. It’s amazing what they come up with and how engaged they become. Thanks for sharing! I am posting back into classroom teaching next year and want to embrace this way of teaching (inquiry and/or narrative inquiry) with Gr. 4/5/6 students. I will be showing your examples for sure. What I especially like about these projects is: the personal connections, the big picture thinking (the ‘gestalt’), a combination of linguistic and non-linguistic representations of the learning and, of course, the passion of both the students and the teacher! This is what learning is all about! Your article is very inspiring. Thanks for taking the time to share the story and photos. Grade 4,5,6 will love this stuff! At that age, the ability to ask questions, search for answers, and create something out of it, will be really empowering. Good for you!! I love hearing about your projects and seeing your examples. The Monopoly game reminded me of a long standing culminating option I’ve offered students – to create a board game to demonstrate their learning. I would agree with the student you quoted…it’s a lot of fun and a lot of work. I recall seeing other teachers looking at my kids who chose that option and I could almost hear them thinking that it couldn’t be all that rigorous – they were enjoying it too much! Nonsense – the joy of learning should be seen through joyful kids! Kids who are enjoying working hard because they want to be. I was always amazed at how creating that board game let me see everything the students had learned…not just the curriculum expectations but beyond! This would never have happened if I had created the outcome for them. There is also an incredible amount of critical thinking that goes into planning a game experience for an end user. It’s the same higher level thinking that goes on when kids program a video game for others in Scratch or MicroWorlds – awesome! Thanks for a great post. I love that your students don’t “stand and deliver” at the front of the room when they present. I am definitely stealing this – From now on we’ll just gather ’round and share. I can see how it would definitely promote more interaction. The freedom you give your students is fantastic. I imagine they often take their learning farther than a traditional lesson would have taken them! Please keep posting these great experiences – Those of us who are just beginning to do this in our classrooms have so much to learn from you! Thanks, Patti! The idea of sharing in a circle came from my students. They wanted to be able to look at each other and talk, and I think that has merit. I’ve found doing it this way promotes more interaction and questions. Rather than being a part of the “audience”, other students become part of the discussion and sharing. Great post about the sharing of student projects. I have been working on “Passion Projects” with my middle school students and it is great to see them dive into their topics. I enjoyed hearing about the circle share rather than a more formal presentation. I will have to bring that into the mix and see how it works. The importance of seeing, hearing and being able to interact with your audience in a more organic/intimate way makes great sense. Passion projects, what a great opportunity for students to explore something that matters to them. Hopefully more teachers will embrace projects like this! Maybe. I think so. nice read, weird how I found this blog. Your articles are beautifully articulated and spot on. I am learning so much from your blog.